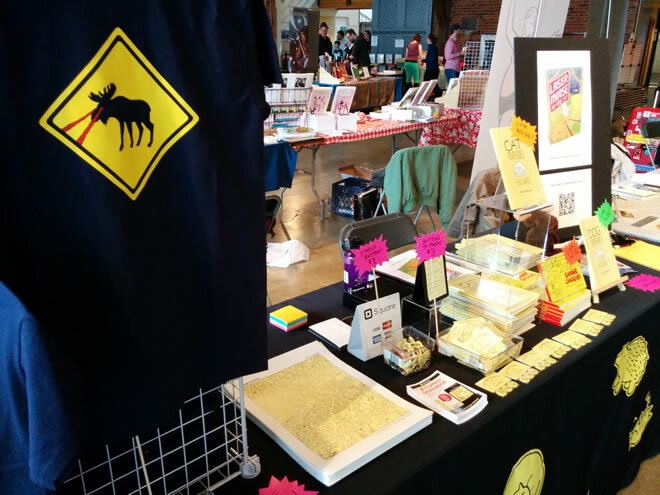 My table at VanCAF, featuring new Laser Moose t-shirts! 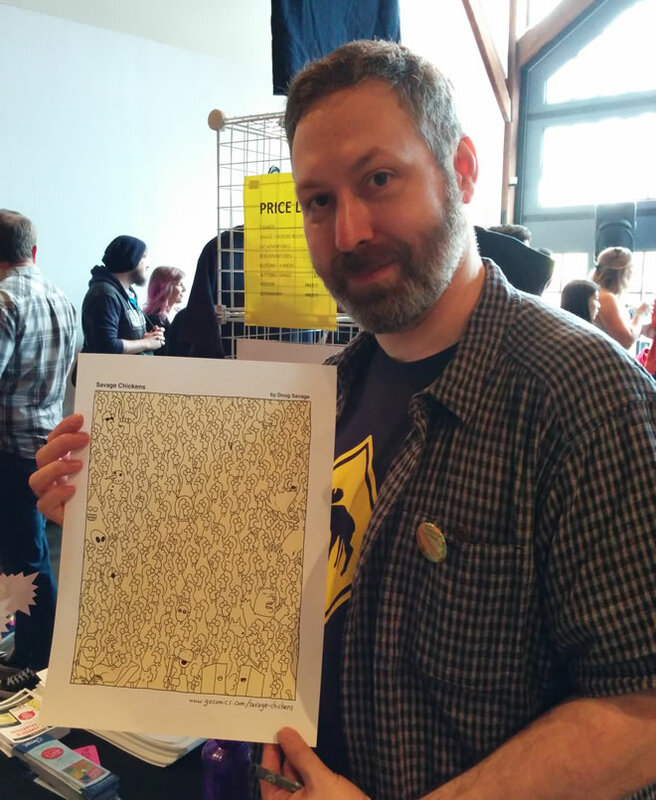 Some fun stuff happened before the show even started: I was interviewed by The Vancouver Sun about my work and VanCAF. And then I talked with CBC Radio about interviewing Lynn Johnston. You can hear their interview with Lynn here on the CBC website. I had such a great time at the show. 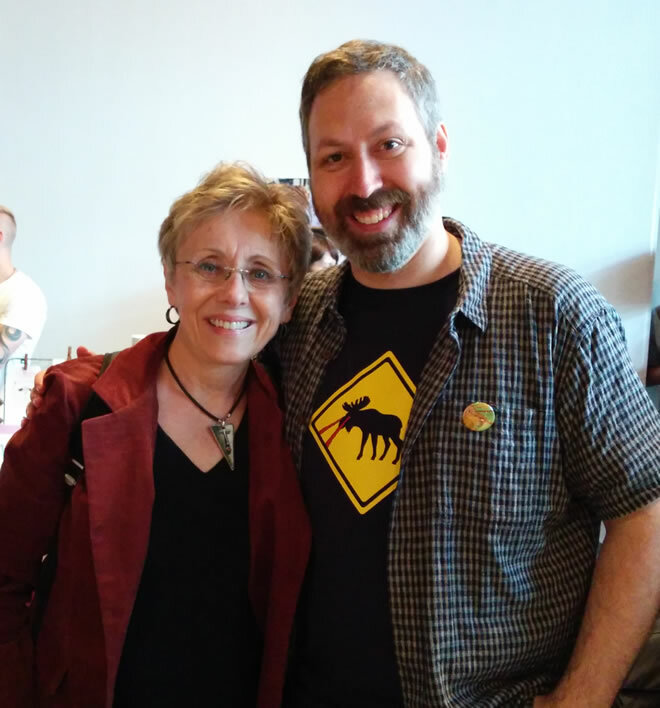 The best part, of course, was meeting Lynn Johnston. I had a great visit with Lynn. Such a fun person! I interviewed Lynn on Saturday in front of a packed theater and we talked about everything from her childhood in Vancouver through to the recent gallery exhibitions of her work and her current artistic projects. Lynn offered great advice, some fascinating insights into the comics business, and some hilarious stories that I’m still chuckling about. I had such a good time – it was the most fun I’ve ever had hosting an event! A big thanks to Shelly Barkes at Andrews McMeel for sending me Laser Moose bookmarks for VanCAF, and to Julie Halper from GoComics – thanks for the great Savage Chickens posters. GoComics sent me these awesome Savage Chickens posters. I gave them to EVERYBODY! Thanks to everybody who stopped by my table to chat and/or buy some books. It was especially fun to see people react to seeing the Laser Moose and Rabbit Boy cover for the first time! I wish I’d had more time to visit other people’s tables and see my local comics friends, but the show was so busy, I barely got away from my table. I did get to see the amazing work of my table neighbours – check out their work: Margo Perrie and Kim Smith! Last but not least, a big thank-you to the volunteers who work so hard during the show and make VanCAF possible. You people are the best! Awesome! If you have any leftover swag or posters, please post how those of us in the lower 48 can buy them. Thanks and congratulations!